Concert at Krasnodar concert hall at 7 pm. Concert at the Kiew Philharmonie at 7 pm. Concert at the Kchmelnitsy concert hall at 7 pm. Concert at the Tchernovtsi concert hall at 7 pm. Concert at the Komitas Hall at 7 pm. Concert at 6 pm. Suvi Matilainen: violin, Tuomas Pyrhönen: organ. Concert at 6 pm. Sole Mustonen: oboe, Tuomas Pyrhönen: organ. Concert at 2 pm. Matti Turunen: bass, Tuomas Pyrhönen: organ and piano. Concert at St Kasimir's church at 5 pm. Works by Narbutaite, Fritsch, Bacevicius, Mazulis and Radulescu. Concert at the Kondopoga Cultural Palace at 6 pm. Works by Bach, Mozart, Schumann, Ciurlionis, Känkänen and Vierne. Finnish choir concert at Langholtskirkja Church at 2:30 pm. Choir music and organ improvisations. Concert at Hafnarfjardarkirkja Church at 1:30 pm. 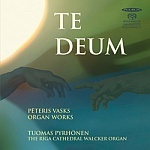 A Finnish organ work Angelic language by one of the most important composer of younger generation Perttu Haapanen. Morning devotion at Laugameskirkja church at 8:30 am. Finnish works by Joonas Kokkonen, Aimo Känkänen, Seppo Pohjola and Jouni Kaipainen. Concert at Ålesund church at 7 pm. Recital at 8 pm. Suvi Matilainen: violin, Panu Matilainen: flute, Tuomas Pyrhönen: organ. Recital at the Paavali Church at 7 pm. Recital at 6 pm, "Organ journey through the centuries"
Recital at the Kallio Church at 7 pm. Recital at the Roskilde Cathedral at 8 pm. Recital at the Riga Cathedral at 7 pm. Night music at 6 pm. Katariina Zaborszky: violin, Tuomas Pyrhönen: organ. Concert at 7 pm. Hannu Holma: baritone, Tuomas Pyrhönen: organ. Concert at 8 pm. Hannu Holma: baritone, Tuomas Pyrhönen: organ. Concert at 6 pm. Anneli Hynninen: soprano, Tuomas Pyrhönen: organ. Night music at 6 pm. Suvi Matilainen: violin, Panu Matilainen: flute, Tuomas Pyrhönen: organ. Jaakko Linjama 100 years, concert at 3 pm. Works by Jaakko Linjama. Recital for the renovated organ at 6 pm. Recital at 7 pm. Works by Bach, Mozart, Schumann, Kodaly, Messiaen and Honkanen. Recital at 6 pm. Works by Bach, Mozart, Schumann, Vierne, Messiaen, Honkanen and Kodaly. Recital at 7 pm. Works by Bach, Nordgren, Messiaen, Vierne and Kodaly. Recital at 6 pm. Matti Turunen: bass-baritone, Tuomas Pyrhönen: organ. Concert at 6 pm. Hannu Holma: bass-baritone, Tuomas Pyrhönen: organ. Recital at 7 pm. Works by Bach, Mozart, Schumann, Vierne, Messiaen, Honkanen and Kodaly. "100th anniversary of the Parikkala church organ" -recital at 7 pm. The program is build around works, programs and exemplars of Oskar Merikanto. Organ recital at 8 pm. Organ marathon at 20, organists: Henri Hersta, Markku Mäkinen, Tuomas Pyrhönen, Pekka Suikkanen, Ville Urponen. Presented by Erkki Toivanen. Organ recital at Käppärä chapel at 12. Works by J.S.Bach, W.A.Mozart, Vierne, Satie and Kodaly. Organ night at the Joensuu church at 9:30 pm. Concert at 4 pm. Anneli Hynninen: soprano, Tuomas Pyrhönen: organ. Works by Rautavaara, Tuomela, Strohofer, Linjama and Mononen. Symphony concert at 6 pm. "Sakari Mononen tribute" at 6 pm. Recital at 7 PM. Works by Vasks, Balakauskas, Pärt, Mononen, Känkänen & Stravinsky. Concert at 6 PM. Jussi Merikanto (bass-baritone), Tuomas Pyrhönen (organ). Recital at 7 PM: improvisation and works by Buxtehude, Vierne, Kuula, Sibelius and Reger. Recital at Kallio Church at 7:00 PM: improvisation and works by Buxtehude, Vierne, Sibelius and Kuula. Organ night and aria. Concert at 22. Recital at 7 PM. Works by Bach, Kuula, Balakauskas, Sibelius and Reger. Recital at 8 PM: improvisation and works by Buxtehude, Sibelius, Kuula, Vierne and Reger. Concert at 12 AM. Lassi Virtanen (tenor) and Tuomas Pyrhönen (organ). Concert at 4 PM. Matti Raijas: trumpet, Hannu Porkka: percussion, Tuomas Pyrhönen: organ. Works by Toivo Kuula, Einojuhani Rautavaara, Johann Strohofer and Leonid Bashmakov. LONG LIVE MOZART! 250th anniversary concert at 4 PM. Tuomas Pyrhönen and Ville Urponen (organ). Organ recital at St John´s church at 8 PM. Works by Carl Maria von Weber, Robert Schumann, Modest Musorgski, Toivo Kuula, Franz Schubert, Emanuel Chabrier, Leos Janacek and Max Reger. Recital at 9 PM. Works by Bach, Mozart, Schumann, Janacek, Kuula, Schubert and Balakauskas. Summer recital of the Organum Society. The recital will be broadcasted live on TV (YLE1) at 7 PM. Works by Leos Janacek, Franz Schubert, Robert Schumann, Anatoli Ljadov and Toivo Kuula. Works by Bach, Mozart, Schumann, Janacek, Kuula, Schubert and Balakauskas. Concert at 3 PM. Suvi Matilainen (violin), Panu Matilainen (flute), Tuomas Pyrhönen (organ). Works by J.S.Bach. Concert at Joensuu Church at 7 PM. Tuomas Pyrhönen (organ), Hannu Porkka (percussions). Works by Tanejev, Gubaidulina, Pärt and Balakauskas. Finnish organ music and parts from Messiaen's "The Birth Of The Lord".